I recently gave a talk at the Royal College of Art on the benefits of 3D printing. I’ll be sharing my thoughts from this talk in a series of blogs. One of the issues I was asked to address regarding 3d printing was: The ethicality of allowing anyone to create anything at such rapid speed. Having access to more stuff does not mean we consume more. And here is the key thing about the enabling power of 3D printing. We, the consumers, should be able to play a part in the products we consume – especially the ones we care about. It’s not about replacing everything around you with things you’ve made or customised; but it is about having the option to do so when you care to and where it makes sense to. For too long consumers have been sold products that they don’t need. With 3d printing we are not being sold products we don’t need, we are given the option to create products we want. The desires and aspirations sold to us through marketing are cut out when you decide what you will print on your machine. Giving a talk championing desktop 3D printing was a great opportunity to reflect on the ways in which the technology is changing the world for the better. We are lucky at Faberdashery. Working at the forefront of the desktop 3D printing industry, allows us unique insights into some amazing amazing projects. Projects where 3d printing is unlocking the potential of truly world changing ideas. e-NABLE is one of those. e-NABLE is a charitable organisation which provides prosthetic hands manufactured using desktop 3d printing. It is changing the world of prosthetics. There are many amazing stories coming from e-NABLE. Mitsuko’s is one of them. Mitsuko lives in New Caledonia. Which is located in the southwest Pacific Ocean, 1,210 km (750 mi) east of Australia. In October she was the victim of a household accident in which her hand was caught in a machine, resulting in the loss of all of the fingers on her right hand. The prosthetic options for her in New Caledonia were very limited. When Mitsuko’s mother needed to travel to Paris for some minor surgery, the family decided to bring Mitsuko in the hope they could find help. Unfortunately every prosthetic option offered would have cost thousands of euros and would have taken months to build. As Mitsuko and her family had to fly back to New Caledonia within weeks this was no good to them. Furthermore, the only devices available would have impeded Mitsuko’s wrist movement. One of the great benefits of 3D Printing is the ability to create bespoke complex objects with a high level of quality in very short deadlines. Which was just what Mitsuko needed. Mitsuko’s father was put in contact with a customer of ours – Thierry Oquidam, who volunteers at the French arm of e-NABLE. e-NABLE is a charitable organisation which provides prosthetic hands manufactured using desktop 3d printing. 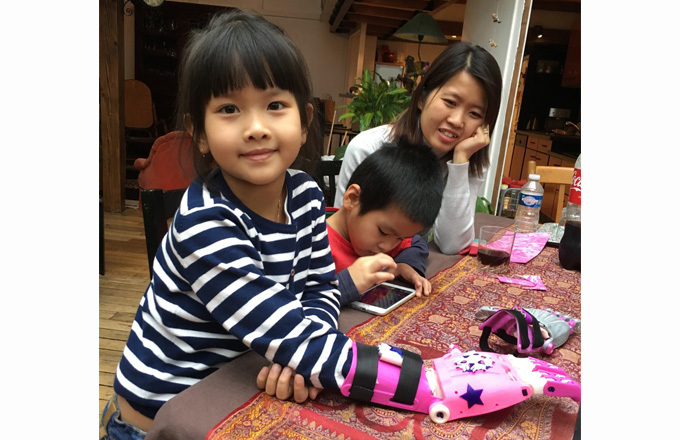 Thierry met Mitsuko for the first time on december the 31st to get her measurements and talk to her about how her new hand would work but also to give Mitsuko a chance to tell him how she would like it to look. She went for the awesome colour combination of Punk Star Pink, Pearly White and Galaxy Blue. And she wanted stars and snowflakes on it! Within 6 days they had a working prototype. And within just 11 days the final prosthetic was was ready. Not only was her hand precisely fitted to her size, but it was also printed and decorated to her specifications, in the colors of her choice. As she grows, the hand can be adjusted to fit her and new parts easily replaced at very low cost. 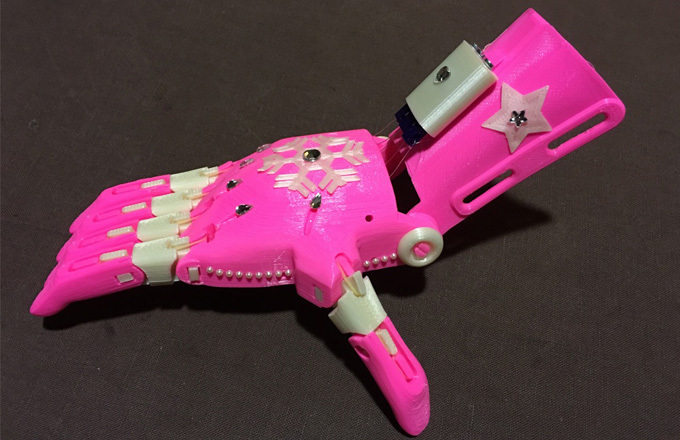 Without 3d printing Mitsuko would be without a prosthetic, and many hundreds like her. So to answer the proposition that there an ethical issue around allowing anything to be created by anyone at such a rapid speed – I totally disagree. I think is there is an ethical issue around not allowing anything to be created by anyone at rapid speed. 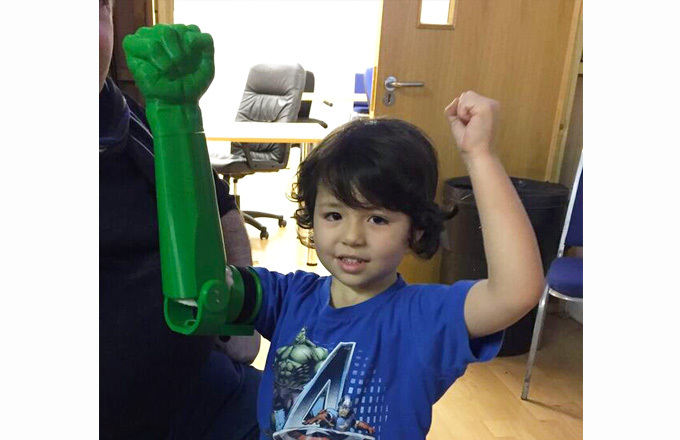 e-NABLE is just one, real life example of the transformative power of consumer 3d printing. And if 3d printing has the power to make such significant changes to people’s lives, imagine how many more world-changing projects are just a 3d print away. To find out more about e-NABLE you can read their story here. I’d like to thank Thierry Oquidam and Ian Lewis for letting me use the photos featured in this blog.